Ransomware attacks are growing in number and scope since 2015 and many security professionals are starting to see them as an epidemic that will only get worse. While the style of attack and their methods are not new, their sophistication and increasingly targeted nature makes falling prey all the more easy. 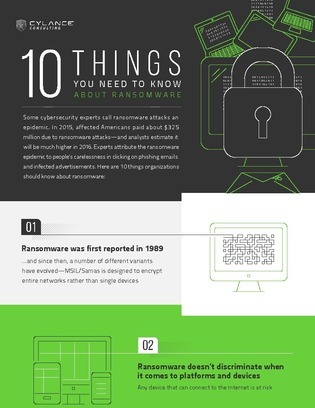 Access this resource to discover 10 facts about ransomware that can position your organization to strengthen its security posture against one of the most damaging cyberattacks on the modern threat landscape.